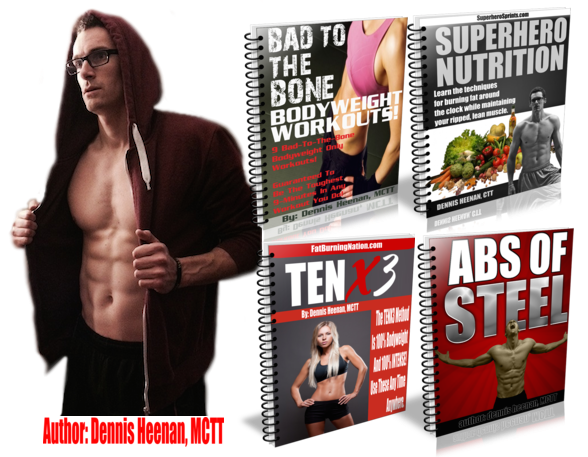 In This One-Of-A-Kind "Get Ripped Pack"
Bad To The Bone Bodyweight Workouts: NINE of the toughest 9-minute bodyweight only workouts you’ll ever try… In a good way of course! Learn to push your "anaerobic limits" in just 9-minutes for maximal fat loss. Superhero Nutrition: Learn the EXACT nutrition techniques that lean and ripped celebrities use to look their best in just weeks, not months. TENX3 Workouts: SEVEN quick and intense, TEN exercise workouts that can be done in just 10-minutes. Perfect for when you are crunched for time or on the go. Abs Of Steel: 7 Levels of ab workouts designed to blast away belly fat while building your strongest core EVER! And RIGHT NOW... Everything You See Is Your's 100% Free!